Weekly genetics review: What are bull breeders considering in 2019? Beef Central recommences its popular weekly genetics coverage today, in alignment with the start of the 2019 Autumn bull selling season. Our weekly genetics reviews went into their usual summer recess after the completion of 2018 spring sales in November. At this time we also take the opportunity to wish Beef Central’s former genetics editor Dr Alex McDonald a happy retirement, and thank him for his valuable contribution over the years. DESPITE a challenging year across most of Australia, bull sales in 2018 held up remarkably well. As reported in Beef Central, 2018 saw sale numbers still exceeded 20,000 animals. And while numbers were down on the record year of 2017, the strong sales results demonstrated a high degree of optimism within the industry. The more pressing question for many breeders and producers is what will the 2019 year hold? The on-going impact of the drought is more likely to be reflected in a number of ways. Nationally, breeding cow numbers have been reduced significantly, particularly in New South Wales and Queensland. MLA recently estimated the national beef herd to decline another one million head, to 26.2 million, by mid-year. Coupled with ongoing and extensive feed bills that have depleted many farm cash reserves, 2019 could prove to be an extremely challenging year for bull breeders. So what are bull breeders focusing on in 2019? 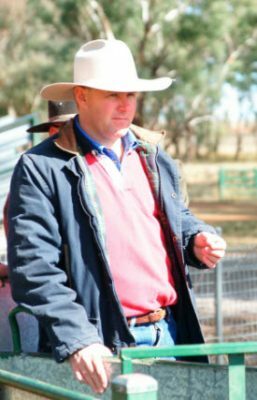 In the lead-up to the Autumn bull sales, I’ve asked a number of prominent breeders for their thoughts on the year ahead. Specifically, I asked what they will be focusing on in their breeds, what they hope their clients should focus on, and finally what they will be doing to prepare bulls for sale this year. Almost all bull breeders highlighted the importance of Breedplan to their programs and to their ability to provide bulls suitable to their clients needs. Each breeder spoke of the importance in providing bulls that would assist producers improve their herds genetic performance. It’s likely that 2019 will see greater push across breeds to improve and increase the genetic information on offer to potential buyers. 2019 has been identified as a year where bull breeders will have to compete harder to capture sales. A common theme was that in 2019 producers will be more selective in the bulls they buy, and with lower cow numbers, the demand for bulls will be lower. Most bull breeders spoke of the need for their operation and breed to focus on creating a “point of difference” that attracts buyers. This point of difference ranges from increased presence in commercial feedback trials, branded beef programs and new breed promotion. Most breeders highlighted the need to focus on producing cattle suited to a challenging environment. A common statement was to use the genetic information provide to select genetics that ensured not only growth, but also maintained fertility in the herd. Producers from several breeds commonly mentioned the importance of EBVs for fatness. Many producers touched on trends such as the demand for “heifer bulls”. While these bulls were often chosen for their Birth Weight or Calving Ease EBVs, there was some concern that producers may be overlooking the opportunity to select bulls that would also provide greater opportunities for growth and carcass yield. The feeling among bull breeders was that producers should try to better understand their overall breeding and market objectives and select more balanced bulls. Ensuring a focus on eating quality was almost universally common across the responses. Bull breeders highlighted the need to not only produce consistent eating quality for consumers, but highlighted the opportunities for their clients to increase their returns by improving eating quality. In general, most bull breeders expressed a hope that their clients have some breeding objectives in mind. Many considered the reduction in the size of the national cow-herd would mean producers will have retained and will join more heifers than they have done traditionally. The hope expressed was that producers would use the 2019 joining to select on a balance of traits and not overlook the potential to increase the value of their progeny in the next three to four years. As bull breeders prepare for 2019 there appears to be an increasing desire to build relationships with clients. Breeders consistently mentioned their focus was on building relationships with clients first and selling bulls second. The other key trend to emerge among breeders preparing for 2019 is the likelihood that sale numbers will be reduced, compared with numbers offered last year. This is due both to bull breeders themselves adjusting numbers to respond to drought conditions, and to reflect lower overall demand from clients. While it’s likely that sale offerings will be smaller, selection pressure on the bulls offered for sale appears to be increasing. Not only does this include a focus on Breedplan data, it appears the use of independent assessment by industry consultants may increase as producers seek to assure clients of the value of their bulls. The impact of the drought remains foremost in all discussions regarding the year ahead. Several breeders highlighted the salvage values in replacing bulls. And that the reduction in cow numbers meant that clients may purchase fewer animals, but should be able to buy better bulls for their herd. The importance of developing a relationship with a bull breeder shouldn’t be underestimated. Breeders frequently commented on their desire to understand their clients’ operations and help find bulls that will make a positive impact on programs. Thanks Alastair for some good reading. Look forward to future stories! Your knowledge and enthusiasm in the genetics/breeding selection area will provide a good platform for your columns.